From cleaning the patio to hosing down the car; a pressure washer certainly takes a lot of the effort out of those mundane household chores. Check out our top 5 to keep your home squeaky clean. Say goodbye to the days of spending hours on your hands a knees scrubbing the outdoor patio (unless you really want to, of course), because with one of the best pressure washers from our round up, you can get the job done much faster and with a lot less hassle, leaving you much needed time to relax with a cuppa on the sofa. A pressure washer does what its name suggests; it uses a high amount of pressure to blast water onto the affected area and obliterate any dirt and grime. There are a whole different range of options on the market, that come with different tools and accessories to help you effectively complete the intended job. These gadgets may seem rather high-tech, but they require minimal effort and don’t have to cost the world, either. Rather than thinking you have to spend a fortune on a flashy model, make sure you consider the features of the pressure washer before buying. There is no point spending hundreds of pounds on a swanky high end machine if it doesn’t actually come with that one attachment that would really help you out, so check the attachments before you commit to buy. The actual pressure of the machines (measured in 'bars') is the key to your success on the power washing front. For cleaning driveways and blasting dirt out of the crevices of window panes, you'll do fine with a machine that has a pressure of around 120bars. If you are planning a more industrial clean, 200bars will just about blast every last spec of dirt from any surface... not for the feint-hearted. If you are planning to use your pressure washer for cleaning your car, variable water pressure is a must, to ensure that you don’t damage anything during cleaning and around 100-110bars should be sufficient. One of the other things to consider which sometimes we don’t think of is the weight of the machine, and where and when you plan to use it. If you want to use it for a number of tasks, make sure it’s not so heavy that you’re going to give yourself a hernia trying to move it. 6-7kg is the weight you should expect for a non-industrial pressure washer, but be warned, the higher power ones can tip the scales at nearly 40kgs! We’ve picked out the top 5 pressure washers 2018 has to offer to cater to all households, lifestyles and budgets, with a summary of each to help you pick the one that’s right for you. Happy cleaning! If you’re looking to enter the world of pressure washers, then the Colee XG-01G is a good place to start. It’s very easy to use by simply switching on and off, and is surprisingly quiet despite its power. It is a little tricky to assemble but this pressure washer has ultimately made our top spot for its all-round convenience. It is lightweight and compact making it easy to store, and although it does not come with tonnes of accessories, it is extremely handy for tasks such as car and garden cleaning. This Bosch pressure washer is a super lightweight and compact model that also comes with a wide range of attachments, so if the Nilfisk model is a little too out of your price range and just a tad cumbersome, this is the pressure washer for you. It’s still not really cheap, but it is worth the price for the amount of accessories and attachments you get with it. The thing we like most about this pressure washer is there is no fussing around with complicated assembly, making cleaning your home hassle-free. For something a little more robust, this premium pressure washer is great at tackling a whole host of cleaning tasks. 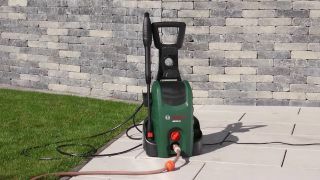 You can control the pressure of the water easily with the power-grip control, which makes this pressure washer safe to use even on delicate areas such as patios or car number plates. Considering its power, this machine is incredibly easy to control and isn’t too cumbersome. Users found it easy to assemble and move about when necessary as it comes with a handle and wheels for easy transportation. For really stubborn dirt or grease, we recommend the Wolf Petrol Pressure Washer to save you time and effort when cleaning. It boasts a large flow of 8 litres per minute, ensuring not a spec of grime is left to be seen. It comes with 4 different attachments to cater to your needs and really looks the part for heavy duty tasks. It’s enormously heavy and does make a lot of noise, but you’re not like to get a clean as powerful as this anywhere else. If you often undertake large cleaning projects, then this pressure washer is a great investment that will serve you well for years to come. If you’re just looking for a machine that will help you out with some odd jobs, then this older version of the Bosch pressure washer will get the job nicely. It is very affordable and although it boats no frills, it is a reliable machine that is ready to use straight out of the box. It comes with integrated storage for all of its parts and accessories so it barely takes up any room and isn’t too heavy to move about. The only downside is it has a shorter hose compared to some, which might make it a little trickier when carrying out bigger jobs. This is a great first purchase that will drastically shorten cleaning time when doing the chores. Liked this and got the cleaning bug? Make light work of cleaning indoors too with our round-up of the best robot vacuum cleaners.